Skin cancer is often painless and each type can look different. BCC often appears as a small red or pink, waxy or shiny lump. SCC often appears as a small pink lump with a hard or scaly or crusty skin. 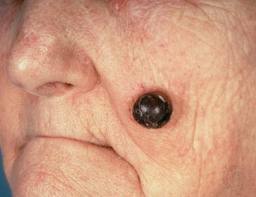 Melanoma usually starts as a dark spot or mole. These symptoms aren't always caused by skin cancer but if you have them, see your GP. 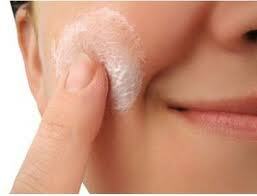 Like all body tissues our skin is made up of cells: basal cells, squamous cells and melanocytes. Skin cancer types are named after the skin cell in which the cancer develops: basal cell carcinoma, squamous cell carcinoma and melanoma. 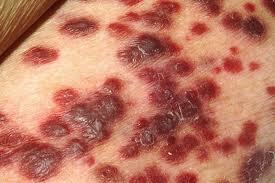 Melanoma: Skin cancer that forms in melanocytes (skin cells that make pigment) is called melanoma. Melanoma is the deadliest type of skin cancer. Basal Cell Carcinoma: Skin cancer that forms in the lower part of the epidermis (the outer layer of the skin) is called basal cell carcinoma. Squamous Cell Carcinoma: Skin cancer that forms in squamous cells (flat cells that form the surface of the skin) is called squamous cell carcinoma. Over-exposure to ultraviolet light, from sunlight or sun beds, is the main risk. Close relatives having skin cancer and being treated with anti-rejection drugs (ie after an organ transplant). Exposure to radiation or long-term exposure to chemicals such as coal tar, soot, pitch, asphalt, creosote, paraffin wax or arsenic. Mole Mapping: Digital photographs or body diagrams are made at the time of the office visit with a physician so that moles and growths are documented and can be monitored for changes over time. Dermoscopy: A hand-held instrument known as a Dermoscope is used to light up and magnify a lesion for a physician. Biopsy: A skin tissue sample or biopsy of the questionable spot is taken for laboratory analysis by a pathologist. If the cancer invades deeply into the skin, a sentinel lymph node biopsy may be recommended. This procedure identifies the lymph node that first receives drainage from a malignant tumor. If no cancer cells are found in the sentinel lymph node, then the chance of cancer having spread to other parts of the body is very low. Confocal Laser Scanning Microscopy (CLSM): It is similar to an ultrasound. This technique uses laser light to display images of each layer of tissue without damaging the skin. Scans: X-rays, CT scans, PET scans and blood tests also may be performed to determine if the cancer has spread. Blood tests: It may be done to identify patients with a family history of melanoma. Whether the growth has spread to nearby lymph nodes or to other parts of the body. Mohs Micrographic Surgery - This method has the highest cure rate of all surgical treatments because the tumor is microscopically delineated until it is completely removed. In addition, it is indicated for the treatment of primary basal cell carcinomas, tumors with poorly defined clinical borders, tumors with diameters larger than 2 cm, tumors with histopathologic features and tumors arising in regions where maximum preservation of uninvolved tissue is desirable, such as eyelid, nose, finger, and genitalia. Simple excision with frozen or permanent sectioning for margin evaluation - This traditional surgical treatment usually relies on surgical margins ranging from 3 to 10 mm, depending on the diameter of the tumor. Tumor recurrence is not uncommon because only a small fraction of the total tumor margin is examined pathologically. Electrocautery and Curettage - This method is the most widely employed method for removing primary basal cell carcinomas. Although it is a quick method for destroying the tumor, adequacy of treatment cannot be assessed immediately since the surgeon cannot visually detect the depth of microscopic tumor invasion. Cryosurgery - Cryosurgery may be considered for small, clinically well defined primary tumors. It is especially useful for debilitated patients with medical conditions that preclude other types of surgery. Radiation Therapy - Radiation is a logical treatment choice, particularly for primary lesions requiring difficult or extensive surgery (e.g., eyelids, nose, ears). Radiation therapy can also be used for lesions that recur after a primary surgical approach. Chemotherapy - Hyperthermic isolated limb perfusion (HILP) is a chemotherapy option for malignant melanoma. It is often used for tumors in an arm or leg that frequently reoccur but remain confined to that area. Carbon Dioxide Laser - This method is most frequently applied to the superficial type of basal cell carcinoma. It may be considered when a bleeding diathesis is present, since bleeding is unusual when this laser is used. Topical Fluorouracil (5-FU) - This method may be helpful in the management of selected patients with superficial basal cell carcinomas. Systemic Retinoids - Although several clinical trials have shown some efficacy for currently available systemic retinoids in both chemotherapy and chemoprevention, the long-term toxicity of these agents generally excludes them as treatment choices for most patients. Photodynamic Therapy - Photodynamic therapy with photosensitizers may be effective treatment for superficial epithelial skin tumors. Follow-up skin cancer care is important because it helps to identify changes in health. 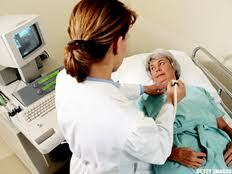 The purpose of follow-up care is to check for recurrence or metastasis. Follow-up care visits are also important to help in the prevention or early detection of other types of cancer, address ongoing problems due to cancer or its treatment that may develop months to years after treatment ends. All cancer survivors should have follow-up care. Most skin cancer can be surgically removed. Cancer is treated in many ways. Many people with cancer will have combined therapy where more than one type of treatment is used. The treatment plan is usually tailored around the individual person and their cancer; it is often the case that two people with the same cancer will have different treatment. Many people will require more than one of these treatments; this is usual and does not mean that the cancer is any worse. The treatments are given in combination to achieve better outcomes, for example one treatment may be given to remove the existing cancer and another may be given to prevent the cancer from spreading further. Again, this treatment depends upon the individual's cancer and their circumstances and is not the same for each person. 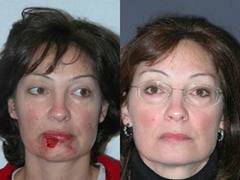 Some skin cancer can be completely removed through surgery and patient can definitely benefit a lot. In some advanced skin cancers, surgery and other procedures can help patient receive relief and prolong their lives. In India there are many hospitals that offers the best surgical pathologists and dermatopathologists are known for their expertise in handling skin cancer cases. These hospitals help you in selecting the most appropriate combination of treatment for your skin cancer. Indian Doctors are committed to providing the highest quality of individualized care to their patients with skin disorders. This entails the application of the newest advances in the diagnosis and treatment of skin cancer in an atmosphere of compassion. The benefits of treatments may extend beyond pain relief, helping the patient feel calmer. The Hospitals in India that offer skin cancer treatment have state-of-the-art facilities, most modern equipment, and extremely professional health care team. Indian doctors combine advanced medical treatment with complementary therapies in order to provide the best results to their patients. Survival rates for patients with skin cancer treated in India are significantly higher than the survival rates of patients with skin cancer in other medical tourism destinations. 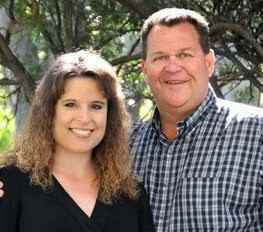 Mr. James and Mrs. Lily Brown from Australia. I still remember the day when I took my husband to the hospital for the melanoma surgery. The doctor who was to operate on my husband was optimistic and kept reassuring us that everything would be fine. The radiation treatment, hospice care and all the postoperative measures were wonderful. My husband today is living a life of ease and happiness with no signs and after effects of cancer. Thanks to the entire team of Forerunners Healthcare. India is a powerhouse in medicine; the center of development and practice of many of the world’s most advanced and effective medical technologies. The medical tourism industry in India is flourishing, offering high standards of care, an international reputation of excellence, and attractive costs approximately 65% below those of the United States and UK. With dozens of quality hospitals, clinics and research institutes around the country, India is renowned as the leader in medicine in the world with particular expertise and success in oncology. Skin Cancer surgery is extremely reasonable in India. If you are looking for low cost skin cancer surgery, India is the best option.